Rail passengers could face congestion charge-style price hikes at rush hour to combat rising passenger numbers. The Association of Train Operating Companies (Atoc) proposed "rail peak pricing" to combat a forecast rise in travellers of at least 28% in 10 years. Atoc said the government's road charging plan could prompt such a move by forcing more people on to trains. But the Rail Passengers Council said travelling at off-peak times should be made "more attractive". 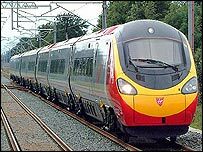 An Atoc future strategy document published on Monday said: "Any rail service which is a practicable alternative for people using the car on a high-charge road journey will need its own peak pricing system." It's the usual clap trap from the private train companies. Atoc Director General George Muir told BBC Radio 4's Today programme: "In the next 10 years the objective will be to run as many trains as we sensibly can, and as long trains as we can, to carry the maximum capacity. "But there will come a point, and we are not far from that point, where we have reached capacity, and at that particular time if road use pricing then comes in it clearly has a knock-on effect on the pricing of other modes." The strategy document - entitled Looking Forward: Contribution to Railway Strategy - also said scrapping under-used trains and stations could help operators handle growth. Franchise requirements forcing operators to continue running these should be ditched, it said. It also proposed lengthening trains on selected routes, improving track lay-outs and changing timetables to allow more trains to run. The report said that overall the network should be able to handle predicted growth through innovation and small investments. But Anthony Smith, director of the Rail Passengers Council, told Radio Five Live: "We are very, very worried that unless more space is made on the train network we're going to be looking at pricing people off, which would be a complete failure." He added: " We've got serious climate change; we've got serious problems with vehicle emissions - we've got to get more people using public transport. It's not a solution to price them off. "What we've said for a long time is make travelling off-peak and at less busy times more attractive - don't price people off at peak times." Mr Muir said rail made a vital contribution to Britain's economy and train operators wanted to see a "stable, well-planned railway, meeting the needs of passengers and freight customers". Cost reduction and improved punctuality were vital, as was planning for future growth, he said. But the RMT rail union said the biggest drain on the industry was the private sector itself. General Secretary Bob Crow said rail firms had sucked out more than £6bn since privatisation. The best way to cut costs was to bring rail operations back into public ownership, he said. "Talk about cutting costs is a bit rich from the private sector, which enjoys more than three times the subsidy that British Rail got," Mr Crow said. Liberal Democrat transport spokesman Tom Brake said the government's recent rail review had failed to crack the problem of overcrowding. "Atoc is wrong to suggest that we can handle this growth by scrapping trains and stations. "[Transport Secretary] Alistair Darling should be looking to expand our railways, not shut them down by the back door. "His promise to explore building new high-speed rail links has an increasingly hollow ring."